I forgive myself that I have accepted and allowed myself to not realize that to Expose Children to Experimenting on live frogs at school sends a very Clear Message that Society Condones the Abuse of other Life forms, and does not Honor Life as A Gift that is Equally given. Giving the false Impression that the Human is a Higher Life Form, when in fact, the Human is the most Dependent Life Form, both physically and psychologically and thus through Creating an Impression that the Human is More than other Life Forms, where Experimenting on Animals mostly for profit became part of the Reality of our Civilization. I forgive myself that I have accepted and allowed myself to not realize that Experimentation on Animals for Profit is part of our Destructive Mental Ecology that is based on Money and Survival, causing a Holocaust on Planet Earth, which has Driven many Species to Extinction, and even made it Acceptable to Experiment on Human Psychology through Influencing the Psyche of the Human to Create a Happy Consumer, resulting in a Human Parasite that will not Stop Consuming ‘till there is nothing left to Consume, showing that Irrationality of the Human Developed to a Higher Level of Irrationality, as Justifiable Irrationality. I forgive myself that I have accepted and allowed myself to not realize that because Life as other Life Forms on Planet Earth is not Respected, The Human Race also Lost all Respect for its own Species, resorting to all sorts of Measures of Self Interest in the Drive to Profit, Resulting in Half the Human Race living in Poverty with the Economic Systems Failing, Resulting in even more being Driven to Poverty without any way Effecting the Inner Being of Man, as Man has become a Complete Isolated Entity that only Values Self Interest and Happiness and the ability to Profit from Life regardless of the Consequences. I forgive myself that I have accepted and allowed myself to not realize that any Activism that Does Not Address the Psychological Dysfunction of the Human Race, is in itself part of the Problem, as Fighting this Lack of Humanity only creates polarized Justifications, and does not change the Root Cause of the Problem, which is a Profit-Driven Happiness-Resulting Economic System that turns Life into Commodities, and puts Man Against Man in a Battle for Survival, resulting in a World that is now Involved Daily in the Battles of an Economic War, which is Devastating even the Species it intended to Benefit: Humans. I forgive myself that I have accepted and allowed myself to not realize that most Activists are in fact only rebelling against their Education, and in many cases – Parents, because they feel Abused by the System. But as History has Proven - once the Opportunity arises for the Activist to Profit from the System, the Abused turn into the Abusers. This process of the Abused turning into the Abuser is well known as a Psychological Phenomenon, and for the Activist to BeLIEve that it will not happen to them Only Demonstrates the Level of Ignorance and lack of actual Understanding of how the Human Psyche is in fact created, and how it in fact functions as part of a Social System that Represents the Currently accepted Nature of a Human Race that Only Runs this Race to Win, No Matter the Sin. I forgive myself that I have accepted and allowed myself to not realize that Experimentation on Animals for the Beauty Industry is Especially Vile and Evil, and Yet Most People like to Look at Beautiful People without Any Consideration How the Beauty Was Achieved, Causing the Karmic Link which Confirms that All Humans, Directly or Indirectly, are Responsible and Condone Animal Experimentation without Question or Remorse. I commit myself to SHOW that the Allowance of Animal Experimentation without Remorse, is a Psychological Disorder, which will, as it already shows, end as Abuse of Human on Human. I commit myself to SHOW that The Human Race as a Civilization is the Result of the transfer of Habits and Acceptances and Allowances from Generation to Generation using Technological Progress to Create a Divide between Life and Human Society, Driving Man to be the Most Inhumane Form to Ever Exist. 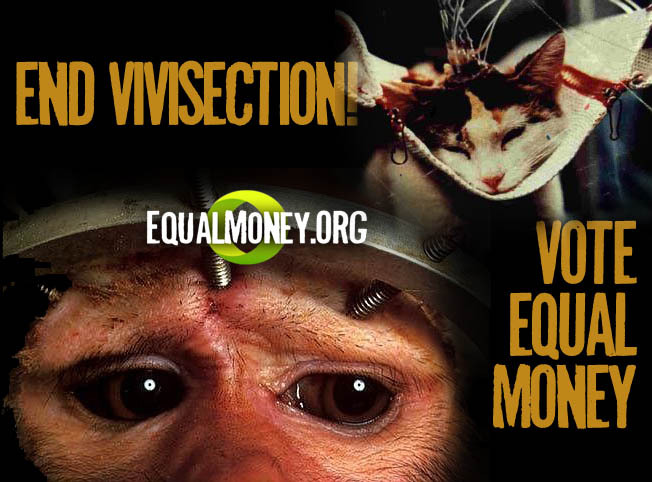 I commit myself to SHOW that the Bible Condone Vivisection, and that Religion DO NOT Act as the Moral Guide to Life as it Should. I commit myself to SHOW that Any Spiritual Group that Claims that this World is an Illusion, in fact, Condone and Participate in VIVISECTION, Shame on You! I commit myself to SHOW that Vivisection is Tacitly and by Implication Condoned by the Interpretation of Dominion in the Bible as Dominance and Control, instead of as Godly and In Service of Life.